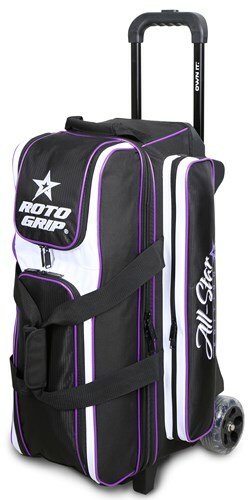 The Roto Grip 3 Ball All-Star Edition Roller holds 3 balls, has a separate shoe compartment, and has an over-sized pocket for your bowling accessories. With the heavy duty frame and hardware, you will have nothing else to worry about other than knocking down all 10 pins! Dimensions: W:14" x D:17" x H:34"
Due to the time it takes to produce the Roto Grip 3 Ball All-Star Edition Roller Purple ball it will ship in immediately. We cannot ship this ball outside the United States.